Sam was great! The place was clean, quiet and comfortable. One minute walk to the Christmas Tree in the square. Cozy, traditional building from the mid 1800’s with wood beams throughout. Comfortable king size bed, pillows and nice bedding. Quiet and dark for a good night’s sleep. My 2 adult nieces stayed on the pull out sofa, was provided sheets, pillows etc. it was adequate. Soft clean bath and hand towels provided for all 4 of us. Good kitchen with dishwasher, provided soap for one wash cycle for the week we stayed so mostly did dishes by hand. Good washing machine for laundry though I had to buy laundry detergent. Refrigerator, microwave, stove, oven, coffee pot and hot water kettle. Heat was good both upstairs and downstairs. Bathroom clean and looked new. It’s a four story walk-up building with no elevator and 66 steps up stairs from the ground floor. Good exercise. We didn’t mind it. Sam helped with luggage which was a pro! My nieces told me they heard a mouse in the wall where they were sleeping squeaking and scuttling but my husband and I never heard it. It’s a very old building and I live in a very old building in NYC. Never saw any droppings or sighted a mouse the whole week we were there. The main problem for us with this place. The shower really only served as a bathtub. It’s impossible to stand up in the shower because it’s built between wood beams and the handheld shower is on the other side of the beam than where the glass door is located so you have to duck under the beam to get to it. Impossible to even take a shower unless you want a Lake on the bathroom floor. This was the main downfall of this place for us. Apartment owner Sam was extremely welcoming, and set us up well. We traveled with a toddler, and Sam provided a baby bed, and even had toddler-friendly dishes and utensils. 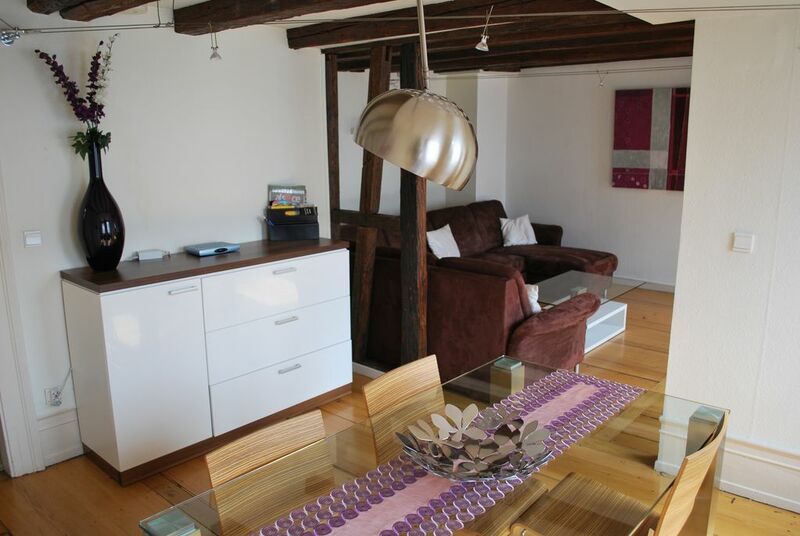 Apartment is from the 19th century, and has a lot of character, including beautoful exposed wood beams. Perfect place to set up camp to see Strasbourg, a short walk from the train station, and located in the heart of the city for easy access to everything. It does get a slight bit drafty in colder weather, but overall a really nice place. We would definitely stay again. Appartement très bien situé, très charmant et propre. A recommander. Tout était vraiment très bien et Mr. Sam et sa Maman sont vraiment très gentils et le déroulement de l'arrivée et du départ était très agréable et simple. L'appartement est vraiment très agrèable et charmant. Une rue très calme mais très près du centre-ville, de la cathédrale et de la petite France. Seul Petit bémol est la douche/baignoire qui ne permet pas de ce doucher debout à cause des poutres qui passent à travers. Mais Avec un peu de fléxibilité c'est faisable. Merci pour tout et peut-être à une autre fois. We stayed here with our 1 yr old daughter and it was the perfect space: clean, lots of room, space to cook and eat as a family and nice to have an upstairs bedroom to put her to sleep while we hung out downstairs. Location is great, minutes to everything. Thanks Mr Sam for warm hospitality! Everything was great. Excellent location in the center but away from crowded tourists places. It was a little bit cold on the first floor of duplex because of wind from the windows (we stayed in january), although second floor was really perfect and very cozy. Kitchen is well equipped and Sam helped us with luggage. We recommend this place for visiting. L'appartamento è stupendo. Molto grande. Noi con una bimba di 2 anni ci siamo trovati benissimo. Sam gentilissimo ci ha anche dato dei giocattoli in piu. L'appartamento è molto grande composto da una cucina con lavastoviglie, forno a microonde e due macchinette per fare il caffe. Poi al primo piano ci sono la sala da pranzo e il salotto con un divano che si può aprire e diventa perfetto per tutta la famiglia. Al piano sopra c'è la camera, nella quale Sam ci ha fatto trovare il lettino e il bagno. Il tutto pulitissimo . Niente da dire ... unico appunto ... per chi come noi ha una bimba piccola ... attenzione è al quarto piano. Quindi la vista è spettacolare ...a anche le scale . Altra cosa da considerare è il parcheggio ... noi abbiamo sfruttato quello dei tram. The 65-sq.m duplex invites you into the heart of Strasbourg's old town. The capital of Christmas, Strasbourg offers you the wonders of its Christmas market, the cathedral lights, museum tours, and parks. This is also a convenient location to visit Alsace, the vineyards, as well as sample the cuisine.